Comes bundled in set of two. Washable! 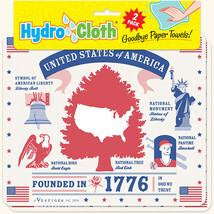 Hydro Cloth®– A multi-use absorbent cloth made from natural materials: 70% cellulose [tree fiber] and 30% cotton. So, be kind to your wallet and the environment and say, Goodbye Paper Towels! 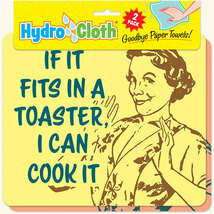 In fact, our set of Hydro Cloths® will do the work of 30 rolls of paper towels. Original designs are silk-screened in the U.S.A. with organic pigments and do not fade when washed in your machine or dish washer. 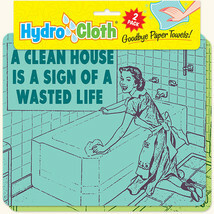 Clean your dishes, wipe down your counters, wash and dry your car, the uses are endless. Use in place of a sponge, dish cloth or paper towel. Unlike a commercial sponge, the Hydro Cloth® dries quickly and will not foster bacteria. To use, wet with water and wring out excess to increase absorbency and softness. 8” X 9” Hydro Cloths® are printed on complimentary colored backgrounds and packaged two per design with an educational header card. This durable and reusable product is a smart choice for your home, office or vehicle. Please, think green and spread the word!